What are the Best Tankless Water Heater Brands? Are you still using a storage tank water heater that isn’t enough to meet your increasing demand for hot water? Then maybe it's time you switch to a tankless water heater. 4) who want to ensure no storage tank water heater will fail and flood their floors ever again. Tankless water heaters give users an unlimited supply of hot water on demand and even when used continuously for multiple purposes. However, on the downside, contrary to the storage-type, investing in a tankless heater may cost a little more. It's the price of convenience and peace-of-mind. That’s why it is essential to buy the right one for you - the first time. In this review article we’re highlighting the 5 best and leading brands of tankless water heaters, although the links to all 10 brands reviewed on tanklesshub.com are linked to by their respective logos at the top of this article in alphabetical order (Bosch, Eccotemp, EcoSmart, Marey, Navien, Noritz, Rinnai, Rheem, Stiebel Eltron, and Takagi). This short list will help you to start your search as you begin to understand who these top brands are and how they differ from one another. You can have a close look at them, do your own research and choose the one most compatible with your needs. 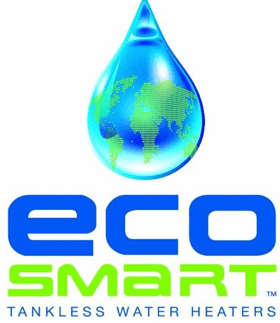 Ecosmart makes a smart buy. It makes a smart buy mainly because of three things. The first thing is that it won’t cost you an arm and a leg - and your kidneys. Secondly, it’s energy efficient. We’re more correct when we say that Ecosmart sells one of the most energy efficient units on the market. To put it simply, Ecosmart saves you money, space and energy. Let’s learn more about it in brief. Water heating costs alone account up to 30% of your overall energy costs. But since Ecosmart units should be run only when the need for hot water arise, they help you bring costs down by at least half the amount. Which also means that less amount of energy us used - you can proudly go green with Ecosmart. Sudden gushes of cold water in the middle of your cosy shower is the last thing you’ll want - specially when you shower on a cold winter eve. To prevent it from happening, Ecosmart uses the Self Modulating Technology and they own the patented right to this technology - which also means that you won’t find it elsewhere. This technology ensures that when you want hot water, you get hot water only. For this purpose, the heater regulates the energy needed on its own. Unlike in most other models, you don’t have to check the water to set the ideal temperature. You’ll be provided with a digital display on which the temperature will be clearly shown. Adjusting the temperature is easy as well. You can increase it by one degree at a time to a level between 80°F - 140°F. This way, you can set the ideal temperature and avoid over or under heating. You don’t have to worry about sneaking an Ecosmart heater into places where your previous heater didn’t dare to go - because Ecosmart units are surprisingly small and compact regardless of their capacity. On top of that, they look sleek and plush - making them easily blend in with your modern home. Warranty, though not always appropriate, is the best way to judge the longevity or the quality of a product. And as far as the buyers are concerned, a lifetime warranty is what makes one of the best buys. 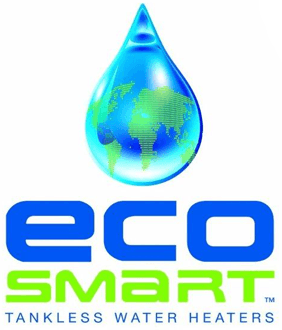 Knowing it, Ecosmart manufacturers provide a lifetime warranty to their tankless water heaters with confidence. Even better - the warranty is also transferable. So if you buy from Ecosmart, you don’t have to think ahead about shifting to your home. 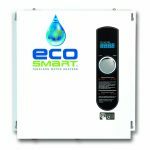 When we set about looking for tankless water heaters, we couldn’t help developing a strong attachment to Ecosmart units than the others. The reasons are quite obvious - these units don’t ask for much to give you the best water-heating experience. They also have pretty high positive customer ratings on every site they’re being sold. Caters to large quantities of hot water needs. Though initially expensive, Rinnai tankless water heaters are one of the highly ranked models on the market today. And over 30 million tankless water heaters installed across the globe are Rinnai models. Some of the many reasons for their success are as follows. In addition to residential needs, Rinnai units are powerful enough to meet even the commercial needs. This is because they’re super fast when it comes to heating water in quite large quantities. Specifically, the Rinnai RL94iP model can supply up to 9.4 gallons of hot water per minute. However, if the supply is high, the next question that might pop into your mind would be the energy efficiency. The good news is that, even though it’s powerful, you don’t have to dread about your energy bills every time you switch it on. Rinnai models are Energy Star rated and they’re one of the two brands in our review with this ratings. And they promise to bring down your water heating costs by a substantial amount as 40%. Due to their high efficiency, you can even obtain tax credits and rebates from your local government - specially if you purchase Rinnai heaters for your office. When you make a costly investment, its reasonable to expect longevity. After all, you wouldn’t want to repurchase another unit anytime soon. That’s basically why the Rinnai manufacturers assure you that their units will last the longest. And if you encounter any problems, you don’t have to replace the entire system because replacement parts are available for purchase. This way, you don’t have to spend all over again. However, you don’t get a lifetime warranty here, like in Ecosmart products - instead you’ll be given around 12 years max. 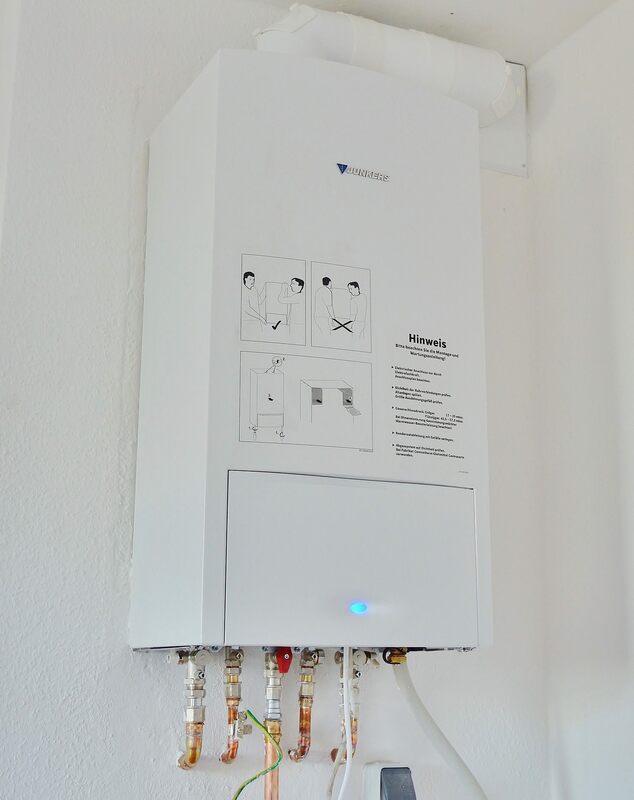 If you can afford them, the Rinnai tankless water heating models are well worth a second glance. Though slightly more expensive, Stiebel Eltron Tempra tankless water heaters have managed to shine among other competitive brands. The following features would help you understand just how. 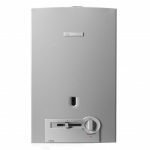 One of the major reasons to go for a tankless heater from a storage tank heater is to reduce your energy bills. Stiebel Eltron Tempra and Tempra Plus series help you achieve that goal. To prove their point further, they help you bring down energy costs by at least 50% compared to storage type water heaters. Quality wise, you can rarely doubt German products and Stiebel Eltron is originally from Germany. When you make a triple digit investment, we understand how much the warranty concerns you. However, the biggest drawback with regards to this brand is that the warranty is limited only to 3 years. Stiebel Eltron units are one of the two only thermostatically-controlled units in our review. And when you set the desired temperature, the Advanced Flow Control technology ensures you get water heated exactly as you ask - nothing less, nothing more. This technology regulates energy and the water supply - according to your demand. At times when your demand is higher than the maximum capacity, then the unit will still meet your demand by slightly reducing the water flow - yet at the same temperature. This way, it manages its operation automatically. Also, the sleek and compact look Stiebel Eltron Tempra units is worth a mention. They will easily save you space, and won’t ruin your home decor. If nothing but quality pleases you, then Stiebel Eltron Tempra are just for you. Cut your installation costs by half. With over 90 years of industry experience, Rheem holds a large proportion of the market share. And the company takes pride in providing tankless heaters run not only by electricity, but also by natural gas and propane. Though not tankless, they even manufacture solar water heating products. Enough about the company, let’s see what they have in their tankless water heaters. The best thing about Rheem products is that you can choose just the right one from the wide range of their products easily. No matter how big or small your water heating needs are, Rheem will have a heater just for you. Though the heaters are small and compact enough to save space, their performance standard is very high. Some of the Rheem heaters can even heat up to 9 gallons of water every minute. Despite that, they still help you minimize your water heating costs by meeting the standards set by the Energy Star ratings. So they become the second model in our review with Energy Star ratings. Since the local government encourages the purchase of Energy Star rated appliances, by purchasing Rheem tankless water heaters, you can claim on tax rebates up to $300. On top of that, Rheem assures you that you won’t be affected by the famous ‘cold water sandwich’ problem. The units are well-balanced and won’t let cold water pass through them in your hour of need. Then there’s also the self-diagnostic system for easy installation. You can save a lot on your plumbing expenses. Most customers even consider some models under Rheem to be the perfect buy of all time. If it meets your needs, then don’t forget to check out their product. At lower prices, but boasts as many features as it can. Takagi is a well established Japanese manufacturing company that is branched even in the US. It offers products starting from the lowest of prices and allows the perfect buy for those on a budget. However, just because they’re cheap doesn’t mean that they make a great buy. The following facts would show you how. The thermal efficiency of Takagi units accounts almost close to 95%. They’re also very much conscious about leaving behind carbon footprints and as a result have adapted their units to be energy efficient. The low carbon emissions of carbon can also be considered as one of their many attempts to go green. To do so, their products are engineered with Air-Fuel Ratio sensors. Ten years from now, suppose you decide your small Takagi unit isn’t enough to cater your family that has grown? No problem - you don’t have to replace your unit. Instead, buy another and link it with your existing model - and double the water supply. The units come with multi-link feature to help you in combining the multiple units. Among the many features of Takagi models, temperature control through a built-in thermostat is a must-mentionable. This ensures that the temperature set is the temperature received. Moreover, the manufacturers have taken extra measures for both yours and the unit’s safety. The units refuse to operate if they get overheated or frosted. And you get a pretty good warranty into the bargain as well. Though limited, the overall warranty of 15 years is enough to swipe off the scepticism of those looking to buy Takagi products. 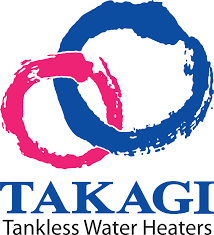 If you want to get rid of your storage tank water heater, but scratching your head about the initial costs of a tankless water heater - then start your search with Takagi models. Out of all cheap models, they give you the best bang for your buck. Well,these are the top brands that I really recommend to everyone. In my experience these are the brands that were reported with the minimum problems. Most of them comes with great warranties and offers the best customer services as well. Going tankless to heat water is not an easy choice to make. There are many many points to consider. Once you’ve done your research, and gathered enough knowledge about tankless heaters, use our reviews. It would help you officially start your search.